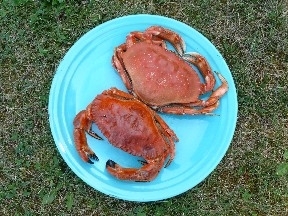 The Pacific red rock crab (Cancer productus) lives in the shadow of the more popular Dungeness crab (C. magister). Really, who's ever heard of a rock crab??? Here, they confront one another. Which one is the rock? The one with the black fingernails. 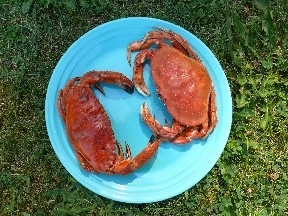 Rock crab are harvested occasionally by sport fishermen when Dungeness aren't available. 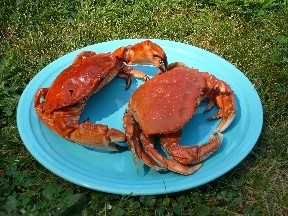 They're tasty, but not as meaty and satisfying as the Dungeness. Like Dungeness, rock crab are voracious predators and have done their darnedest to prevent the invasive green crab from taking over estuaries along the Pacific coast. Go here to see pictures of a rock crab chowing down on a green crab.